It helps you to tone and reduce volume. Every time we decide to start going to the gym we are assaulted by a question: where do I begging?, and although there are experts to guide us in the process, we will always have doubts. To start and to keep doing the same daily routine requires having the conviction that it will give great benefits to your body and your health. Entering a Fitness Club and looking at so many devices can cause a big impact, because you do not know if you will have to use them all to define your body, lose weight or simply gain muscle mass and tone. It is normal to have fears at this important point. The crucial thing to start in a gym is that you need to have clear your objectives, what do you really want? So the instructor can guide you to achieve it so, don't worry, you will not use all the devices at once. When we are looking for fitness equipment, it is easy to focus on a specific one, because of all of the advantages it offers for beginners: the static bicycle, it generates the funniest discipline in the world. We are talking about Spinning. You see it and you think "It will be easy! ", and yes, you will have to use it not only because you are a beginner, but because it is part of the exercise routine that the certified trainer will program for optimal performance. The music along with the pedaling activity can make you release a lot of adrenaline in just under an hour. The heart reaches the maximum and the muscles get intensely exercised, so you can be sure that if to try a Spinning class once, you will want to do it again. * It can be adapted to your needs, whatever your level and your resistance are. * The strength we make on the bike will depend on the resistance we put. If we are on our first classes or we have little strength we can choose a short resistance class. * With spinning you will always be the one to determine how much you get tired, how much you can give, and how you want to do the class. The resistance of the bicycle adapts to us, to our level, and to our desire. * Spinning does not require prior knowledge. Even if it's a sport with music, it does not require to know complicated choreographies or to take a time to learn how to enjoy a class. * Whatever your age, and your level, I'm sure you will be comfortable in a class like this. * It is the perfect sport to lose weight. 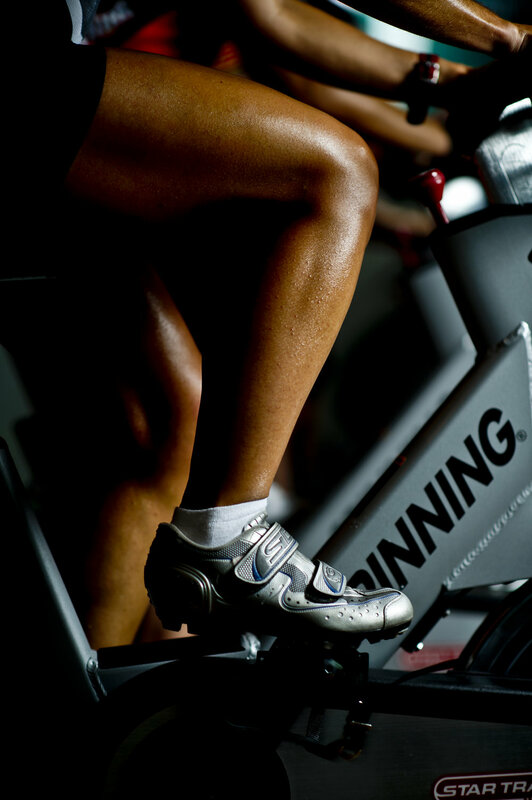 Spinning combines aerobic and anaerobic work, because it changes the rhythm all the time. In a 50 minutes class we can lose between 500 and 1000 calories, being one of the sports that can burn the most calories in such a short time. Therefore, it will be an ideal sport if you are looking to lose weight and get fit. * Spinning will improve your endurance, and increase your muscle mass. It helps to work the heart and strengthen the whole body. * This discipline is ideal to tone all the lower train, to tone the abdominal muscles and especially the leg and buttock muscles. If you are looking for good legs and glutes, spinning is ideal for you. * It is super fun, with this practice you will say goodbye to stress, because full volume music while you focus on pedaling and giving everything, helps you to forget everything for a moment. * With Spinning you will not have problems with your knees, legs or back, as with other sports that will demand more of your legs; that are why they also recommend it for people with arthritis, since it allows moving the legs in a smooth way. * The only drawback with spinning is that you could adopt a bad position and want to press your intensity when you are starting, so the instructor must be very attentive to all your steps. SPINNING® is an aerobic and leg exercise mainly, where by changing the frequency of pedaling and the resistance to movement, you can make the body burn the right calories while exercising on a stationary bike. It is estimated that with the practice of SPINNING®, in one hour you can burn between 600 and 800 calories, in addition to providing the body with other benefits such as reducing stress, helping with cardiovascular health, strengthening bones and muscles and reducing cellulite. SPINNING® is a training system that is aimed at all ages, from children to seniors and is even convenient in rehabilitation processes, such as knee injuries. At PLUS Fitness Club we think about everything, that's why we offer you spinning classes with highly trained personnel to achieve results in a short time through this experience. With all these benefits of spinning. El SPINNING® es un ejercicio aeróbico y de piernas principalmente, donde mediante el cambio de la frecuencia de pedaleo y, de la resistencia al movimiento, se puede lograr que el cuerpo queme las calorías adecuadas mientras se ejercita en una bicicleta estática. Se calcula que con la práctica de SPINNING®, en una hora se pueden quemar entre 600 y 800 calorías, además de proporcionar al cuerpo otros beneficios como disminuir el estrés, ayudar con la salud cardiovascular, fortalecer los huesos y músculos y reducir la celulitis. El SPINNING® es un sistema de entrenamiento que está dirigido a todas las edades, desde niños hasta personas de la tercera edad e incluso es conveniente en procesos de rehabilitación, como en caso de lesiones en las rodillas. En PLUS Fitness Club pensamos en todo, por ello te ofrecemos clases de spinning con personal altamente capacitado para lograr que, a través de esta experiencia, observes resultados en poco tiempo.